We’re crossing the Val di Merse in the early warmth of a new summer that adds a touch of magic to tranquil fields where red poppies and golden sheaves add splashes of colour. 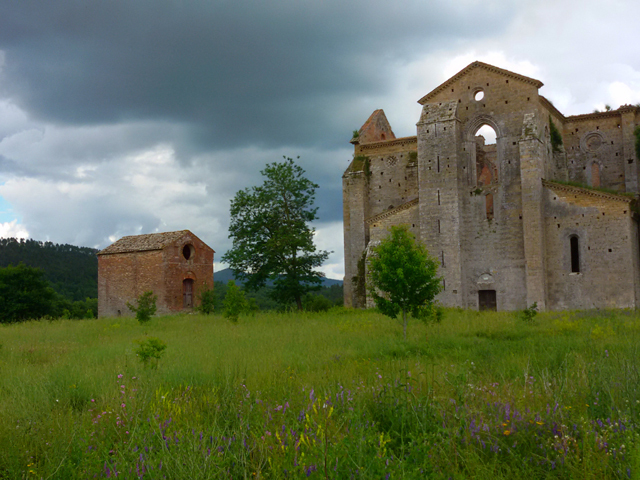 A mystical silence reigns here in the south west of Siena, where the pace of life follows the rhythm of the seasons with time for quiet prayer and working the land. The road takes us to Chiusdino, as if all of nature’s unspoken power was moving in harmony to guide us towards an explosion of notes, triumphant bows and the delicate chords of a harp. 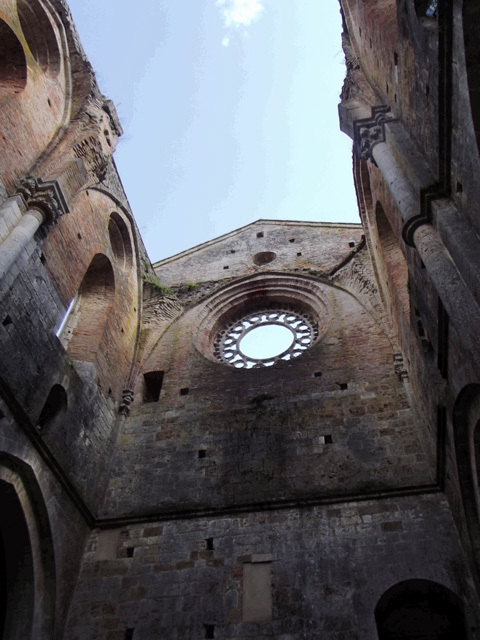 Because these are the sounds your soul hears when the San Galgano abbey appears before you out of nowhere. And as a prelude, a road lined with cypress trees only enhances our sense of awe as we make our way towards the flying buttresses and turquoise roofs. It’s a roof that constantly changes colour, that creates a play of light, amplifies the sounds of nature and is full of stars when night falls. A roof that doesn’t exist. 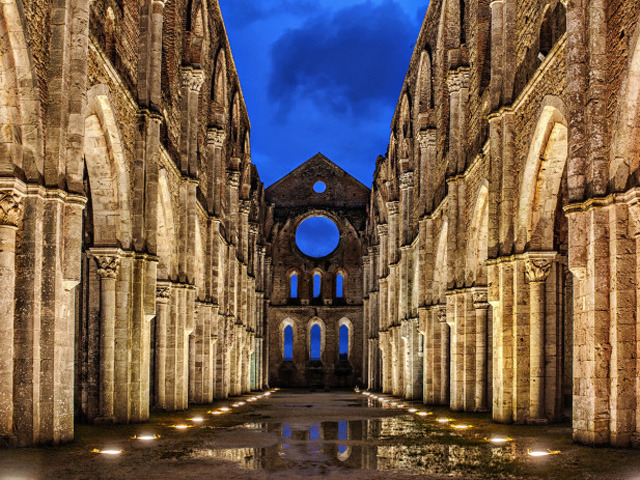 There in the silence the collapsed roof, the imposing walls that are still standing, the skeleton of columns and flying buttresses and the engraved rose window are all witness to the history and poetry the abbey carries with it. 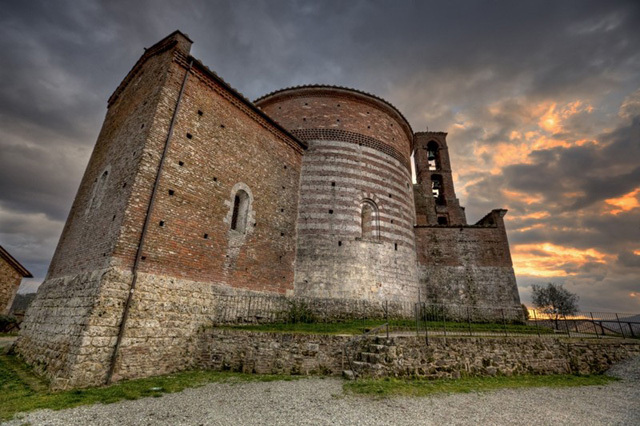 Built in 1218, it was used for religious ceremonies until the 15th century under the patronage of Frederick II, a known alchemist and seeker of the Holy Grail. After the glory, plague and famines marked the start of a decline that reduced art and sacredness to mere walls that were suitable only for storing building materials. The lead roof was sold to make ammunition, several years later a bolt of lightning destroyed the bell tower and bad weather did the rest. A story of wealth and decline followed by a new glory that rises up following a period of neglect and disintegration typically experienced by the wounded. 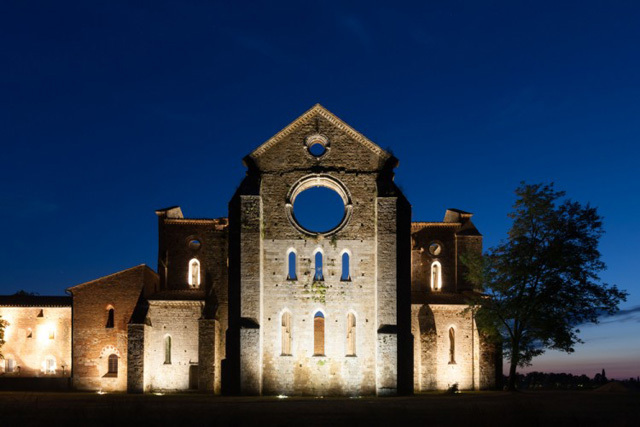 Striking to those seeing it for the first time due both to its isolation and the sacred atmosphere it exudes, the abbey is reminiscent of pagan temples where the absence of a roof is an invitation to join with the universe. 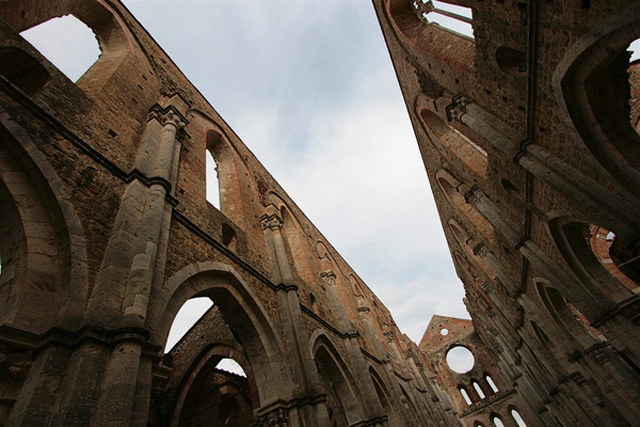 The Gothic style lends the church a dramatic beauty; the missing floor paves the way for a blanket of grass and wild flowers and the remains of the altar speak of faith and eternity. 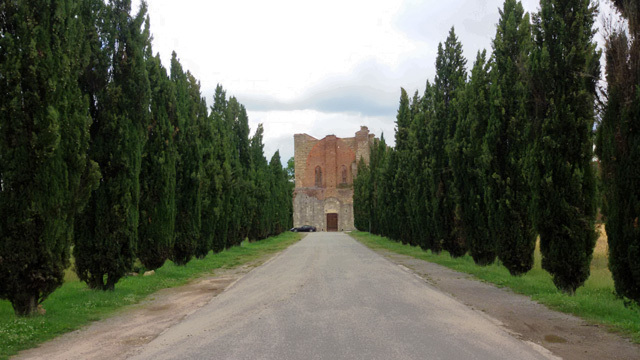 Next to the abbey, a steep incline leads us to the hill where the charming Hermitage of Montesiepi lies proud with its circular layout typical of pagan temples. It is said that an empty crypt lies underneath it that has never been excavated, and that the unique structure of the hermitage is none other than a perfect solar calendar. 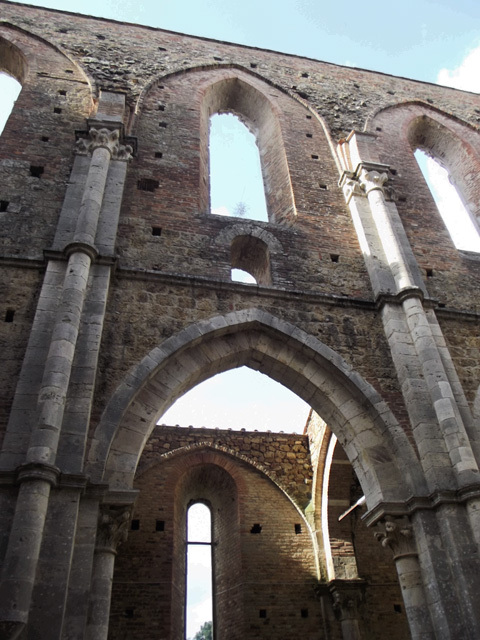 In fact on 21st June when the first rays of sun from the summer solstice penetrate the openings, they fall on specific points in the central chapel and illuminate the sword of Saint Galgano. 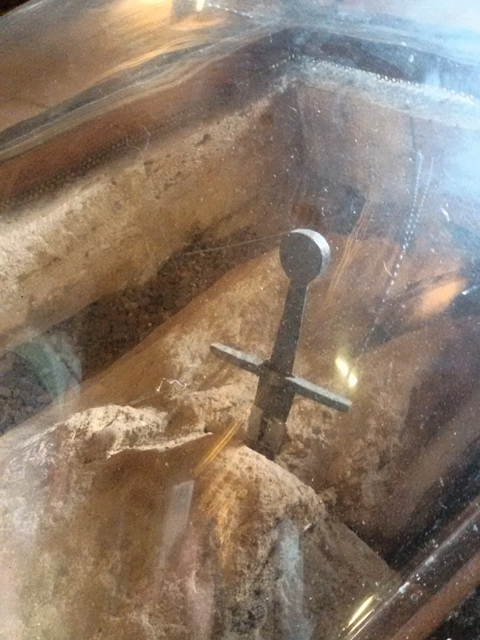 Yes, there is indeed a sword embedded in a stone, which breaks up the uniformity of the stone floor in the centre of the hermitage. Legend has it that the saint plunged it into the ground to create the symbol of the cross and to declare that he had abandoned a dissolute lifestyle when he truly found God. The similarities with the story of King Arthur and the round table are uncanny. Whatever the real story, the fact is that this enchanting place is in harmony with the play of light from the sun that streams through the Gothic windows and the symphonies of breezes as well as the fluttering wings of birds. A moment suspended between Heaven and Earth, open to God and Mother Nature. It’s so lovely to sit surrounded by these walls adorned by meticulously designed bands of artificial light; waiting until dusk to be thrilled by that roof of stars, understanding that we are all part of the same light, a single power. Raffaella Pensieri is the founder of Breathe Italy, a tour operator founded in the hubbub of London and prompted by the need to return to authentic moments in her homeland. 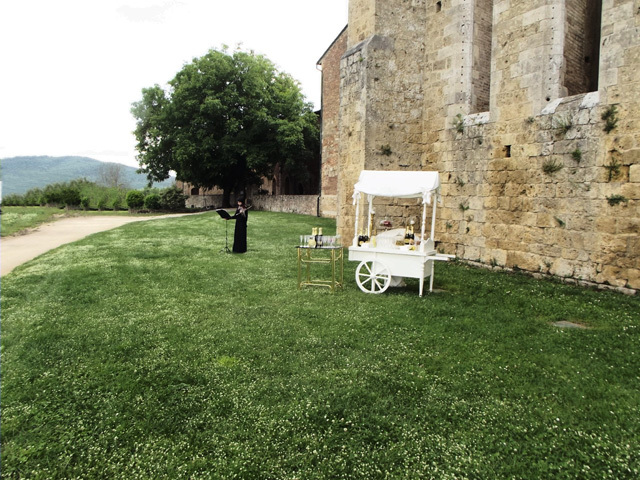 Her blog details inspiring experiences and unique places that enable you to discover Italy through a fresh set of eyes. Rediscovering the soul and essence of life! Follow her on Twitter, Facebook , Instagram, and Pinterest. 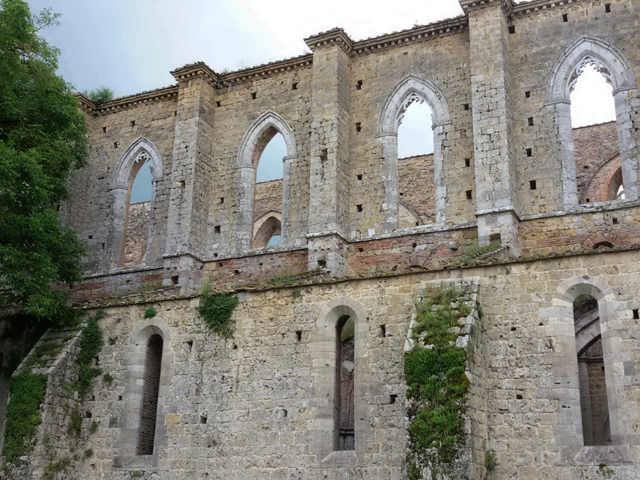 Concierge tip: San Galgano is located approximately halfway between Florence and the exclusive Maremma coastline in Tuscany. 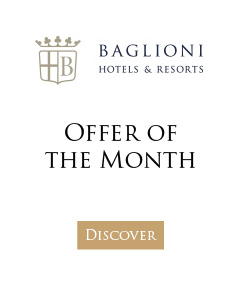 Why not plan a short break in late summer that combines a stay in the historic 5-star Relais Santa Croce with an opportunity to relax on a private beach in Punta Ala?